Carrying a roll of USB lead in your back pocket is not very convenient (besides, it makes your bum look big). 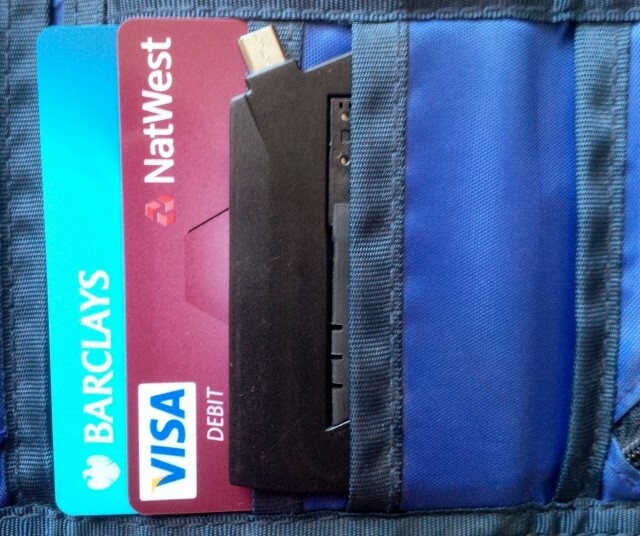 Lucky there is Nomad Goods Inc. who’ve come up with two brilliant products – ChargeCard and ChargeKey – destined to solve the dead smartphone problem at last! Cable vs. Nomad – which one would you prefer to carry around? ChargeCard is a credit-card sized alternative to micro USB cabling. It fits in your wallet. Whenever you need to charge or sync your phone, out pops the flexible plug allowing you to connect to the closest computer or portable solar charger. ChargeKey, as you can judge from the name, is a key-sized cable that goes on your keyring and is size-wise somewhere between you house key and your car key. I’ve been using these cables for the last two weeks and been trying to subject them to as much abuse as possible. Looks like the materials are good quality. 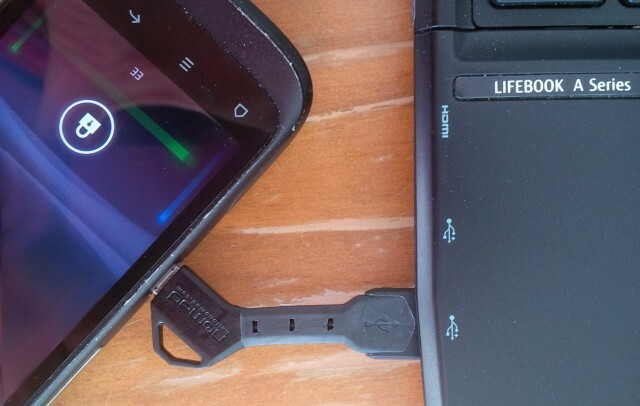 The ChargeKey consists of two hard plastic tips joined together by a flexible rubber section. You can twist and stretch the key and it doesn’t even think about coming apart. It does make sense because if you’re going to be using it as prescribed – in your pocket bunched together with metal keys – it’s got to withstand a lot. 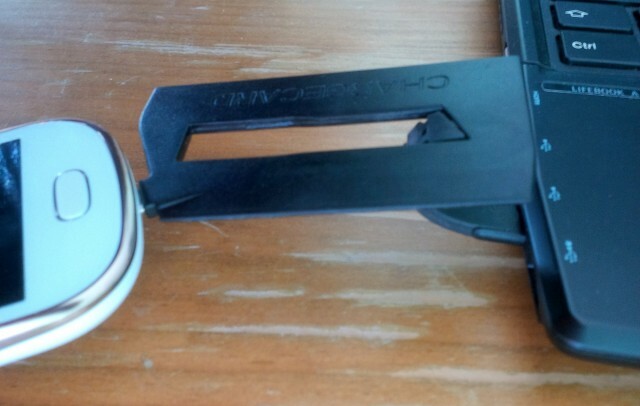 The ChargeCard is solid plastic, slightly thicker than a credit card (2.5mm) with the micro USB end sticking out on one side and the thin USB jack snapped in the middle. It sits on a flexible stalk and can be popped out of its recess whenever you need to charge your phone. As far as convenience of use is concerned, I prefer the key because it’s more straightforward but as I don’t use a keyring, I’ve settled for the ChargeCard in the end. I did try to use the Nomad charge cables by dangling my phone off the side of a desktop PC and a wall charger. It seemed like it held the weight of a phone all right but in the end I propped the phone up with books (real paper ones not the Kindle ones). I wouldn’t recommend you dangle your smartphone in a way that it can succumb to gravity and fall to the ground. 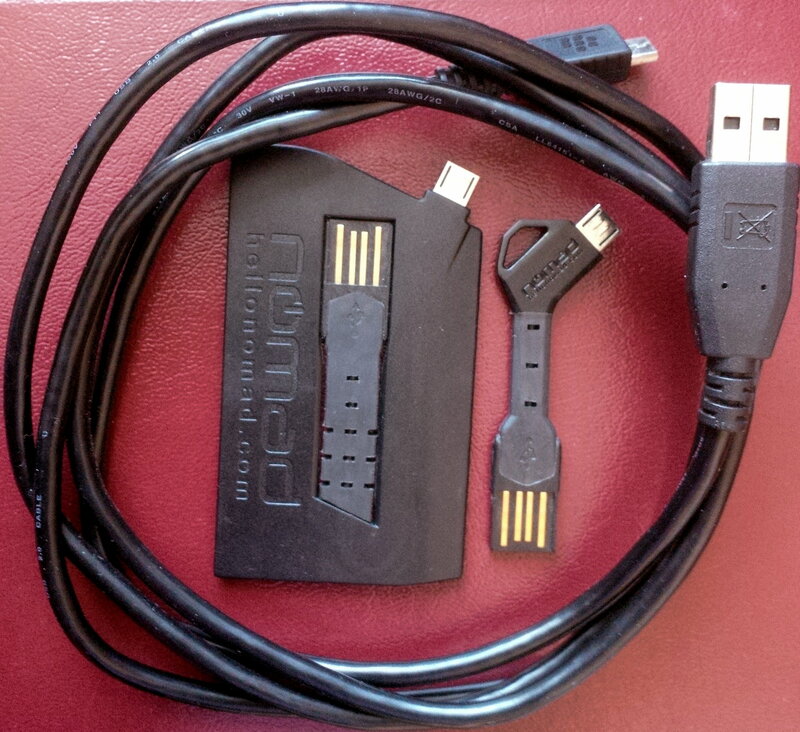 Priced at $29 Nomad portable cables are neither cheap nor expensive. Yes, a standard micro USB cable retails at around $7 but then again you probably got one free with every device you’ve bought. So $29 for a chance to ditch the annoying old-school USB lead sounds like a good deal. You can buy universal ChargeKey and ChargeCard supporting most of the Android and BlackBerry phones as well as a version for iPhone. The Nomad products are also sold in the UK and they retail at £20.